He has been bedridden at a San Fernando Valley hospital for nearly two weeks. Austin Powers star Verne Troyer is entering rehab after alcohol abuse put him in the hospital again. 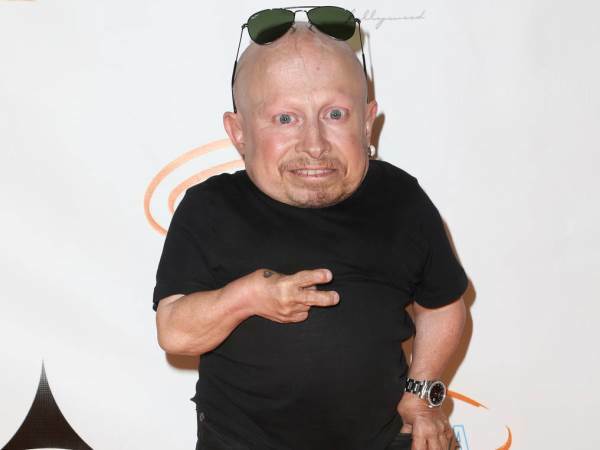 The pint-sized actor, who shot to fame in the late '90s portraying the character Mini-Me in Mike Myers' spy comedy films, has told TMZ he has been bedridden at a San Fernando Valley hospital for nearly two weeks. The 48-year-old star has been receiving treatment for alcohol addiction in the medical facility and he plans to check into a rehabilitation centre to further address the issues at the end of the week. Verne is relying on fans' support to help him pull through the new low, telling the outlet: "With your (my supporters') help, I got this." Troyer has struggled with alcoholism for years and he almost lost his life from alcohol poisoning in 2002. He has sought treatment in rehab multiple times in the past. The actor was hit with another health scare in March 2015, when he was rushed to hospital after suffering a seizure while signing autographs for fans at a meet-and-greet event during the Heart of Texas Comic Con. The star was released from medical care the same day and assured worried fans in a video posted on his website he was "fine". "I'm sure you guys have heard some news that I went to the hospital," he said in the video clip, "But I just want to reassure you and let everyone know that I am fine. "I was there for maybe a couple hours, did some tests, and now I'm here at the hotel and I plan on signing again tomorrow." Troyer kept his word and attended the second day of the Heart of Texas Comic Con.